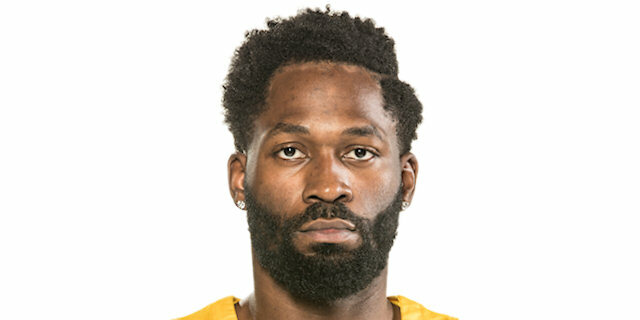 Jeremy Pargo tied a career high with 26 points as Maccabi Electra Tel Aviv held off Zalgiris Kaunas 79-72 at Menorah Mivtachim Arena to improve its standing in Top 16 Group E. Maccabi improved to 7-4, while dealing a serious blow to Zalgiris playoff hopes as the Lithuanian champs fell to 4-7. Maccabi appeared to be cruising when it took a 12-point lead into the fourth quarter, however Zalgiris kept the hosts scoreless for six minutes in drawing within 66-60. 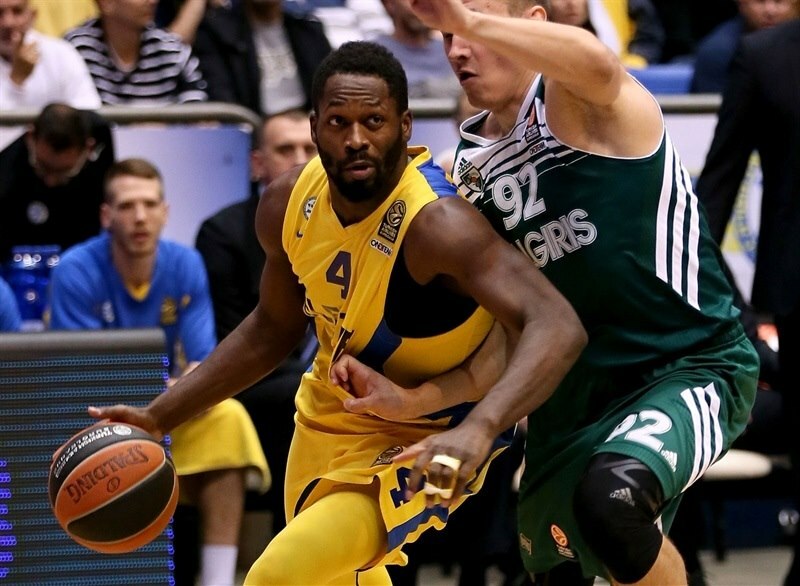 Pargo ended the Maccabi drought and went on to score 10 points in the final four minutes to lead the champs to victory. Devin Smith added 19 points, while Alex Tyus scored 10 and Yogev Ohayon dished 7 assists for the winners. 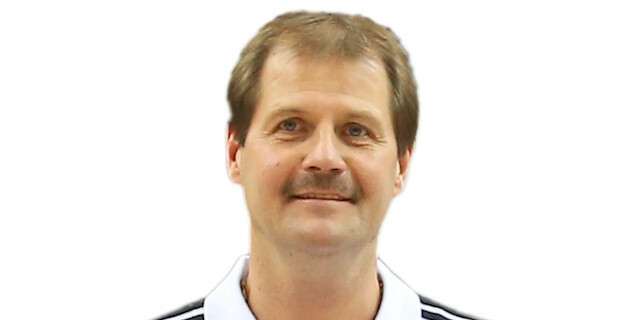 Arturas Milaknis made 4 of 7 threes in scoring 19 for Zalgiris. Lukas Lekavicius added 13 points and 6 assists, James Anderson tallied 12 and 6 and Paulius Jankunas corralled 11 rebounds in defeat. A tip-in by Edgaras Ulanovis and layup by Robertas Javtokas got Zalgiris off to the right start. Brian Randle found Tyus for an alley-oop slam and Maccabi’s first points. 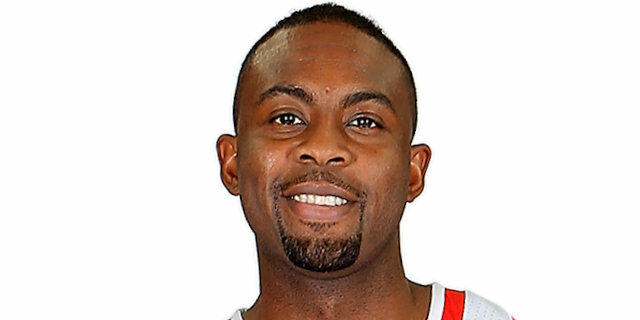 Pargo tied the score with a jumper. The visitors went back ahead on a Lekavicius rebound and layup. Maccabi took its first lead on a Tyus jumper from the foul line than made it 8-7. Lekavicius and Pargo traded threes to make it 11-10 midway through the quarter. Lekavicus split free throws to tie the score. Pargo drove through the Zalgiris defense for a layup and then drained a three to give him 10 points and Maccabi a 16-11 lead. Randle added a basket-plus-foul. After a timeout, Darius Sonaila sank a pair of jumpers to close the gap to 18-15. 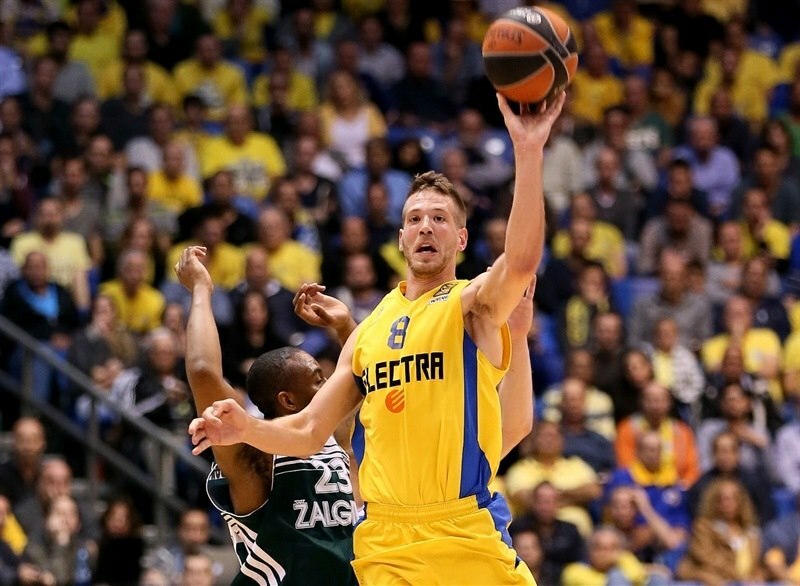 Sonaila sank another shot before Nate Linhart opened his account for Maccabi with a three-pointer. Will Cherry scored a tough layup in transition to make it 21-19. Ohayon lofted a pass to Randle for an alley-oop layup. The Randle set up Tyus for a one-handed slam. Cherry scored a tough basket to keep Zalgiris in the game. Tyus’s free throws made it a 6-point difference, Lekavicius kept Zalgiris in the game with a basket in the paint. Paulius Jankunas and Javtokas each missed from point blank range. Smith drained a jumper at the other end, Javtokas made it 29-25 midway through the quarter. Smith added free throwsm but his poor pass led to Milaknis’s fast break layup. The Zalgiris sharpshooter brought his team within 31-30 with a three-pointer. Smith banked in a shot and then drilled a triple as the hosts regained control. Songaila sank another jumper from the same spot as before, but Smith responded with free throws. Tyus rose high for a block of Lekavicius and Randle converted a layup at the other end. 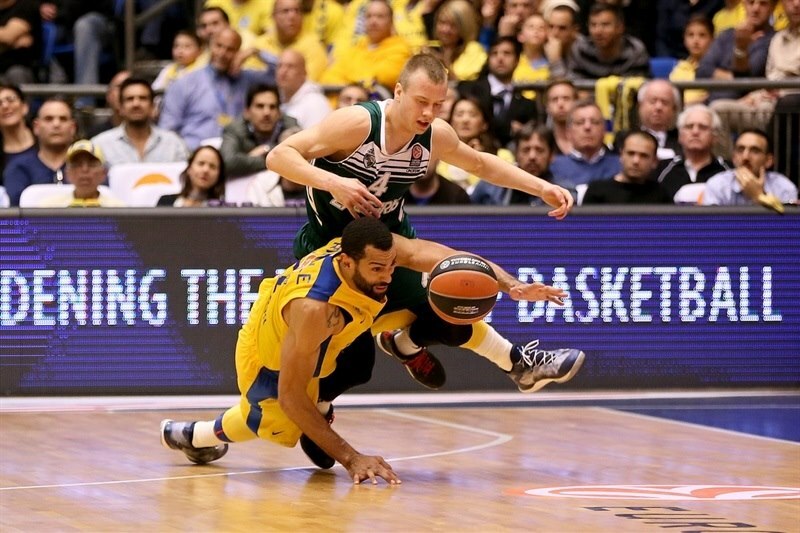 Smith’s triple gave Maccabi its first double-digit lead, 43-32, before Anderson’s floater made it 43-34 at halftime. Milaknis opened the second half with a three from the corner. 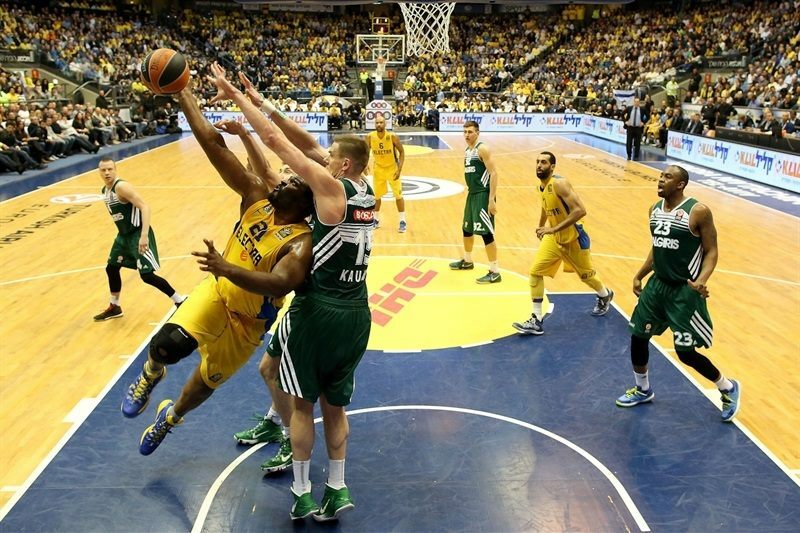 Ohayon drove for a Maccabi layup, but Anderson set up Javtokas with a no-look pass and the latter dunked. Then Lekavicius drilled a three to make it 45-42. Pargo fed Tyus for yet another alley-oop slam, but Javtokas scored inside and Jankunas made a baseline jumper to bring the visitors within 1. 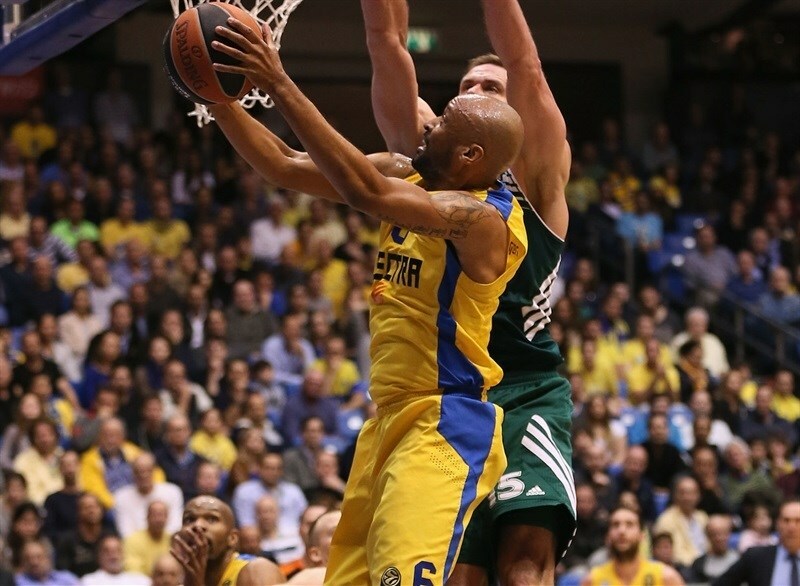 Smith recreated some margin for Maccabi with free throws and then a three-pointer for a 52-46 lead. Pargo added a basket-plus-foul. Milaknis tried to ignite the visitors with a tough layup and a three-pointer. 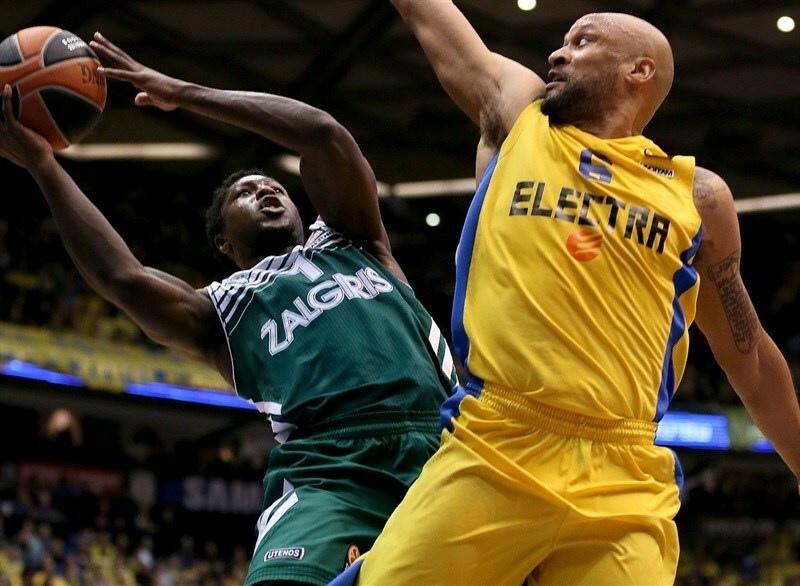 Sofoklis Schortsanitis scored his first points in between. After Randle’s next basket, Schortsanitis free throws restored a double-digit Maccabi advantage. Anderson struck from downtown for Zalgiris, but Pargo matched him. Big Sofo spun for a reverse layup off the glass for a 66-54 cushion. Cherry drove for a layup and Anderson drilled a three to bring Zalgiris within 7. Jankunas split free throws to make it 66-60. 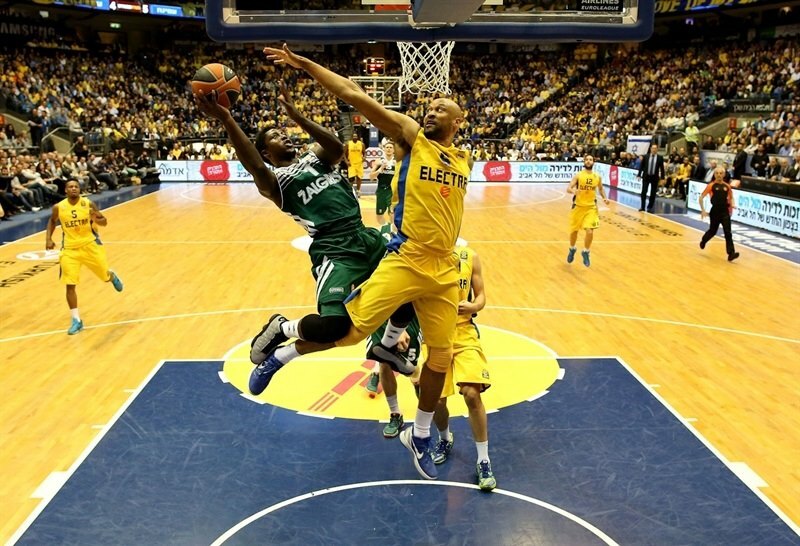 The Zalgiris defense continued to shut Maccabi out, but its offense was unable to get going at the other side. After Anderson missed a contested fast break layup, Linhart rejected Milaknis. 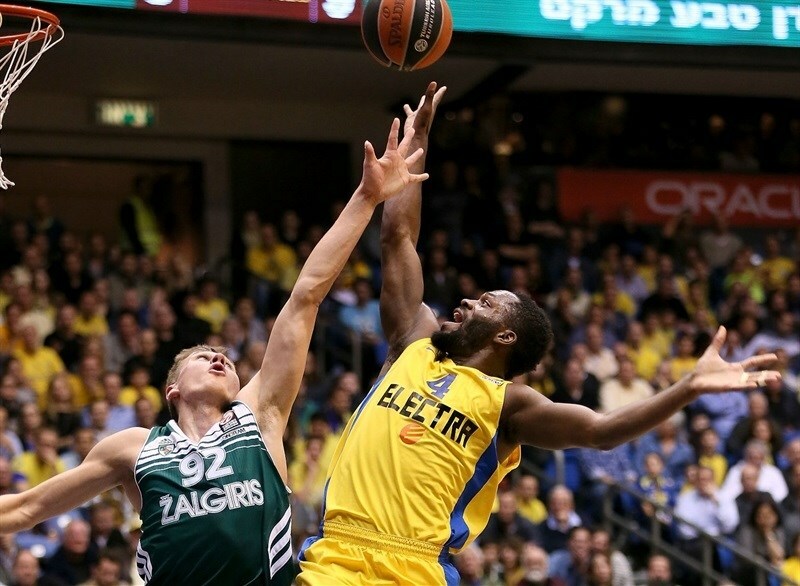 Pargo banked in a shot that ended a six-minute Maccabi drought. 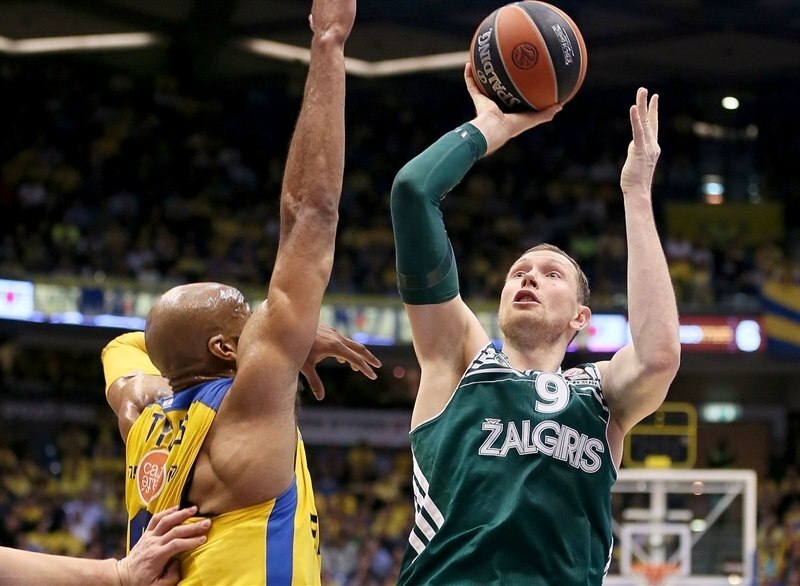 Milaknis kept Zalgiris in it with 2 free throws and a key offensive rebound. However a Pargo triple with 2:35 to go followed by a Randle steal seemed to restore the momentum to the hosts. Pargo free throws made it 73-62. 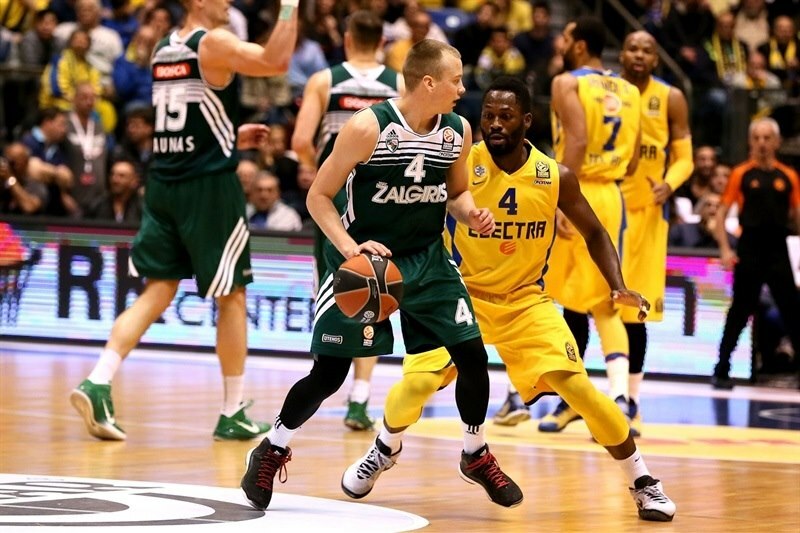 Zalgiris came back within 7 on a Milaknis triple, but Pargo reached 25 points in helping Maccabi wrap up the victory. "I think we got a very important win today in a game which was not simple. We didn’t put on a great performance. We gave a lot of chances on defense. The fourth quarter was not good for us offensively and we didn’t get into the pace. But also these are the sort of games we need to play and win. Of course I want us to improve along the way because we will have more difficult games. But now we are one win from the [playoffs]. For us to get to where we want to go we need all the players to be focused. I am not angry, but I am concerned. I told the guys in the locker room. On one hand, well done, on the other hand I am not satisfied. I know we can play better and we have a lot of work to do." 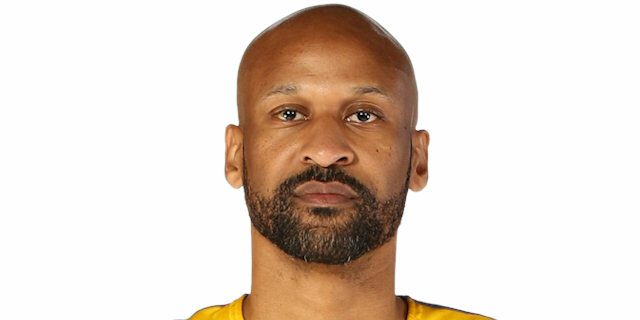 "In the last quarter we had chances to close the game, but we were not able to do it and that is why we lost the game. On the side you are trying to do everything possible to give everything to the players, to convey your feelings and what you want to see. I think the players were trying to press with the hope to steal some balls. 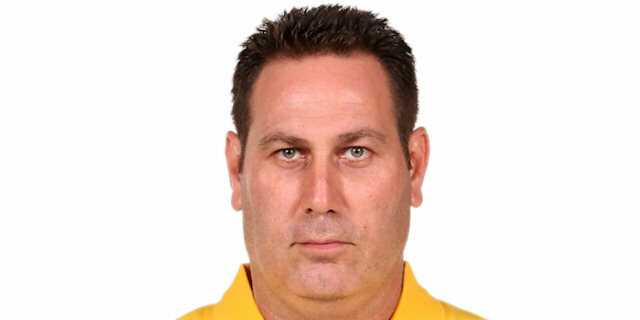 But when you have real good quality players like Maccabi has, it is not so easy." "We didn’t play our best basketball tonight, but at the end of the day you want to get a win. Fortunately for us we were able to do that tonight. We have a big game coming up and we look forward to it. The offense got stuck a few times. It is times of the games where we had small problems; we made mistakes which combined into big mistakes. As a point guard I have to clean up. As a team we have to clean up and win games, and luckily we were able to do that in the fourth quarter. We are doing our best to qualify, no matter who we play against." "We won and that’s what’s important – getting the win and that’s what we got. We just didn’t have a rhythm at certain points of the game and we have to do a better job of that. We have to come back and practice and work on better execution. I am taking it game by game, step by step. It was definitely a big win. We have to take care of the home games." "When we made our run, instead of us adding the pressure on, we kind of slacked off and they took advantage of this and got the crowd back into it. No question it is a difficult place to play, but for the most part I think we can play better. I have played better this season and we had a chance to steal a win on the road.They made some big shots, Pargo made some big shots and really had it going tonight. Devin Smith had it going as well. They made more big plays than we did."